We all have such differing definitions and expectations of grief. When asked to define grief, love, beauty, we often begin to play a game of word association, or we resort to metaphors and personification. Pain and sorrow. My heart hurts. It’s like a well that never fills up. But when I think about grief… my mind becomes a conflicted torrent of the difficult and the mundane, the ugly and the beautiful. Why, you may ask? Shouldn’t grief be a non-gray construct? Because grief is achieved through memories; we are overwhelmed with grief when someone dies, because we loved them. We hurt, because we remember mistakes and regrets, happiness and love. In a way, grief, after a time, becomes a celebration. (That’s why grief is given stages.) We aren’t meant to live in sadness forever. We should hurt, but we should also remember, and in that we can often find solace. 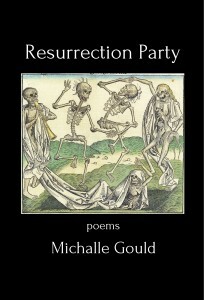 Michalle Gould combats this disjunction of celebration through poems that have been a long time coming. In over ten years’ worth of work, Gould establishes what it can mean to grieve, and even why we grieve, while similarly associating with love, death and relationships. These seem, on the surface, to be such broad, winding concepts—and they certainly can be—but they are so interconnected with grief in these poems that they become entirely necessary to grief’s existence: without something to cherish, there would be nothing to miss. And this concept is so unthinkable and perfectly complicated through Gould’s use of imagistic language and metaphor, traditionalist qualities and hints of religion. There is so much to love about these poems and their truthful nature… these are just a few points I’d love to discuss. This poem has continued to be one of my favorites of Gould’s, first for the first, third and fourth stanzas, but also for the transformation of the narrator’s physicality, as well as the transformation of skin, as separate entities. While we see the narrator transform through abstractions, which might suggest physical maturation, and the length, vulnerability and mortality of our skin, which reminds me not only of the entirety of our mortality, but the constantly looming possibility of a life ending and grief repeating. As if this transformation of images and ideas were not enough—throughout many poems in the collection, mind you—there is also the integration of elements of the tradition, as well as religion or the sublime. While we may view the poems that are imitating traditional forms, or traditional language, as ghost-forms or “influence poems,” these elements invite traditionalist language in a way that invites thoughts of immortality on the page—and a continued conversation between published writers. By employing a particular form—even only a ghost-form, or certain sentiments of a form—it calls back to those writers who regularly employed these forms, and often employed them well. This speaks, too, to the presence of religion or the sublime in a poem, the constant reaching out to the supernatural or immortal, which may take us back to those poets who performed this same search, such as Keats. So as a sort of meta-commentary, then, in a series of poems that are already focusing on grief as a process, we may not only reach the point of celebrating those we’ve lost, but we may also celebrate previous writers by employing their forms or engaging with similar topics. Michalle Gould has done something wonderful here by way of grief: she has reminded us of the stages involved in the grieving process, and how that can eventually lead to a time of celebration—both, with our loved ones, and with our best-loved writers. In exploring and employing the transformation of language, image and idea, we are constantly on our tiptoes, considering how one image can become the next—such as a sturdy bowl of plums to a snowy hill—as well as the use and adaptation of forms, these poems are lovely explorations of change. This is a collection that I can easily read multiple times, always be surprised, and find something new that I loved… and I highly recommend that you try out the same journey. MICHALLE GOULD recently moved to Hollywood to work as a librarian, after living in Central Texas for several years. 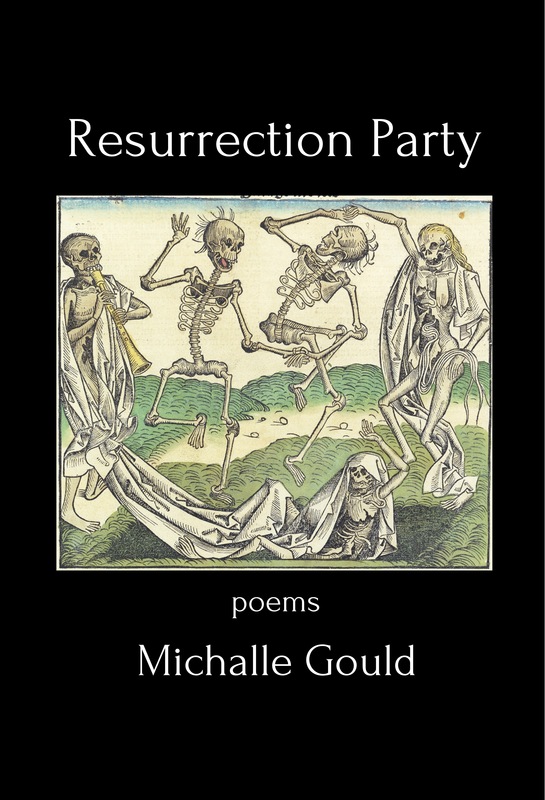 Her first full-length collection of poetry, Resurrection Party, was published in August 2014 by Silver Birch Press, a small independent press located in Los Angeles. Poems from the collection have been published in Poetry, Slate, New England Review, American Literary Review and other journals. Another poem is in the process of being developed into a short film. In addition, her writing has been published in The Texas Observer, online in McSweeney’s, and in many other journals. She also writes fiction and is currently researching and writing a novel set in the north of English in the 1930’s.